Give your greetings another dimension! Give your greetings another dimension ! 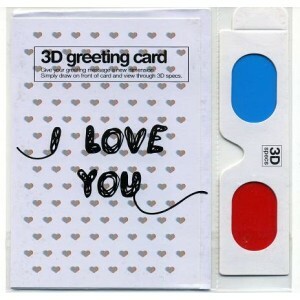 Just write or draw on the card with a black pen, then view through the 3D specs to see your greeting float above the card ! 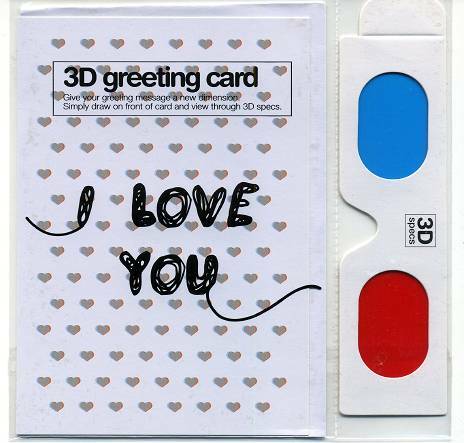 Each pack include a blank greetings card, envelope and a pair of 3D specs which clip to the back of the card for the recipient. Full explanation on the back of the card and printed cellophane wrap to demonstrate the effect. A small kit to understand the image in relief.